When Dr. McKay is trapped underwater in a sinking Puddle Jumper, his only chance for survival may be an hallucination of Samantha Carter. Dr. Rodney McKay is out on a test flight of a repaired Puddle Jumper with Griffin, a pilot from the Daedalus. They are returning from the mainland over water to Atlantis. The inertial dampeners are damaged in an explosion and one of the two propulsion pods goes out. They can’t compensate in time and crash into the ocean. The ship is damaged and the two men are knocked unconscious. The Jumper sinks into the sea. Back in the city’s control tower, Dr. Radek Zelenka monitors the flight. For a whole hour he cannot contact the Jumper. McKay and Griffin wake up with head wounds and finally answer the radio. They have sunk to 1,200 feet below sea-level and are falling steadily. The front window cracks, and their only hope is to seal themselves inside the rear compartment. Griffin sacrifices himself by rushing to the front controls, shouting, “Good luck, Rodney.” He closes the bulkhead door just as the water rushes in. McKay is stunned at the heroics, and terrified that he is stuck in the back of a sinking Jumper all alone. Desperate to save himself and disoriented from his head injury, McKay starts talking to himself to try and focus. He gets his laptop interfaced to the ship’s computer, and discovers that the transmitter isn’t working so far under water. 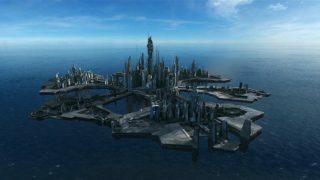 Without the signal, Atlantis won’t know where to look for him in such a vast expanse of ocean. But he also realizes that there is a significant power drain from the inertial dampeners. He can’t shut them off, and now he has only three hours of life support. Worse, as the ship descends the increasing pressure of the water threatens to break up the ship. Add the problem of needing to heat the compartment under so much frigid water, and McKay has additional power needs. He tries to shut down as many systems as possible to conserve energy, almost killing himself from a build up of too much carbon dioxide. Punch drunk, he realizes his mistake and manages to scrub the C02 from the air. Based on the flight path and the ocean currents underneath, Zelenka’s team narrows down the search area. The Ancient database in the Atlantis computers describes the ridges on the ocean floor and the depth the disabled Jumper can go. Zelenka knows it is somewhere between 2,000 and 6,000 feet of water. He thinks nothing can reach it. But Lt. Colonel John Sheppard tells Dr. Elizabeth Weir that there is a way. Now that they know a Jumper can be used as a submarine to a depth of 1,000 feet, he can fly it down there. Sheppard figures that if Atlantis’s cloak could be made from it’s shields, then a Puddle Jumper could turn its cloak into a shield to hold back the water (and the increasing water pressure below the normally safe depth). Using a thousand-foot cable brought by an oceanographic team and a magnetic grapple used to lower F-302s into the Jumper bay, Sheppard thinks that he can take another Puddle Jumper deep enough to grab McKay’s ship and drag it closer to the surface. There, deep-sea rescue divers can cut the crew out. Dr. Weir approves the plan. Zelenka is ordered to accompany Sheppard, and agrees only reluctantly. Radek isn’t comfortable in Puddle Jumpers even under ideal flying conditions — in fact, it was his reluctance to go on the test flight that forced Rodney to take his place, putting him in this life-threatening situation. Meanwhile, McKay is suffering from a concussion. He hallucinates help in the form of Lt. Colonel Samantha Carter, from Stargate Command back on Earth. She shows up pretty in pink, and promptly begins arguing with him. McKay realizes he’s hallucinating her while she teases him to distract him from trying to rescue himself by making the Jumper swim. Sam — or, rather, the part of his subconscious that she represents — doubts his new plan, and believes that his best bet is to stay put, conserving power and life support and giving his team a chance to find him. He continues to argue with her, while she reminds him all the while that he is really arguing with himself. She wouldn’t be there if this wasn’t something part of him wanted to hear. As he works on his next plan, Sam pulls out all the stops to distract him: She shows up in a bathing suit and kisses him. But he recognizes her attempts to distract him from his brilliant idea and — after a few kisses — pushes her away and gets back to work. McKay hears whale sounds echo through the walls of the ship, and realizes that there’s a sea creature out there attracted by the ship’s emergency transmitter, and can only hope that it will go away rather than hang around waiting to eat him. Sheppard and Zelenka dive into the ocean in a second Puddle Jumper, and reach the maximum safe depth. Zelenka succeeds in jury rigging a shield, allowing them to go deeper. The search begins. Unable to trust others to get the rescue job done, McKay wastes half his remaining power trying to raise the ship. It crashes back onto the ocean ridge, causing micro-fractures to appear on the hull. The ship starts to flood with icy sea water. McKay now has to heat the water to stay alive, consuming even more of the remaining power. He is truly helpless. Sheppard and Zelenka are not able to locate McKay’s Jumper deep below them — but they detect the sea creature circling, and follow it to find the ship. Zelenka tells Sheppard the grapple won’t work because McKay’s ship weighs too much from being flooded with all that water. So Sheppard lands the ship on the ocean floor next to McKay’s Jumper and extends the new shield around both ships. All McKay has to do is open the door and walk over to Sheppard’s ship. But Rodney is afraid he is hallucinating Sheppard’s voice. Sam convinces him to trust his team and open the rear hatch. His friends wait on the other side to take him home. From the safety of the rescue Jumper, McKay looks back and sees Sam waving goodbye. “Rodney is in a Puddle Jumper that goes down in the ocean, and it starts to sink fast. You should see the VFX. I thought the ocean FX for ‘The Eye’ were cool; these are light-years ahead. VOTE! How would you rate Atlantis's "Grace Under Pressure?"